Was delighted to receive my pin brooch very well packaged and delivered so quickly – thanks so much! 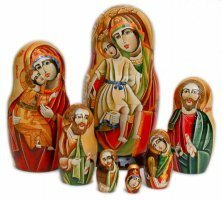 It contains 7 stacking dolls crafted of wood, skilfully hand painted and varnished with gloss finish. The dolls are signed by the artist. The dolls are all hollow except the smallest one, and can hide one inside another.